Happy Skincare is a natural health-obsessed DIY-er’s dream! And it all started way back in 2010 in our kitchen when Aaron mixed up a 100% natural stretch mark cream for Phoebe’s pregnant belly. Since then the dream has become a reality and we’re so lucky to spend every day immersing ourselves in what we love – creating amazing organic, 100% natural, vegan skincare products and taking care of our growing family. We’re an unusual team but it works so well… an ex naval officer and ex IT queen! 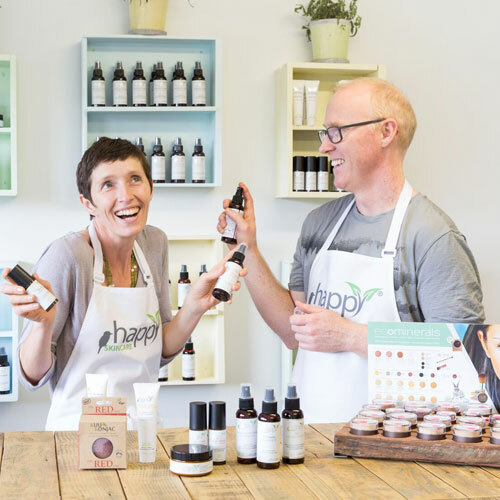 We’ve got bucket loads of enthusiasm, way too much positivity, and an uncanny desire to make the very best natural skincare products that Australia has seen. It’s not just the 2 of us in the business anymore – we’ve grown to a team of 4, and we’re looking to make that 5 very soon. Right now our #1 mission is to teach anyone who will listen about why you need to ditch aluminium based antiperspirants. There are so many unhealthy deodorant choices in our supermarkets, but the majority of people don’t realise that the products they’re using are potentially harmful. Most antiperspirants contain aluminium which has links to serious health concerns. So we’re encouraging everyone to ditch the aluminium, because we’ve created a deodorant that works just as well, if not better. Like all of our Happy creations, the Woohoo All Natural Deodoant Paste is 100% natural, vegan and cruelty free. The good news? You don’t need to choose aluminium-based antiperspirants anymore. Woohoo! It took a loooong time to get where we are, and the journey is far from over. We have this fabulous place in Maryville, Newcastle (NSW) which we’ve dubbed the “Happy Shed”. It’s the home of our little shop and where we manufacture all of our products. It’s a far cry from our origins of making our beautiful products in tiny batches in our retro-fitted laundry, but if we had to do it over again we wouldn’t change a thing. Your customers are everything. Listen to them, respect them, treat them like family, and they will see the passion that you have for what you’re doing and keep coming back. Our biggest challenge has been tapping into the constant energy supply that’s needed to stay on top of all of the work we have. There have been a lot of late nights. We need to keep checking in with ourselves and making sure we don’t get stuck working “in” the business and that we make time to work “on” the business to keep it growing and evolving. Surround yourself with a wonderful, supportive team. You can’t achieve great things on your own! But at the same time don’t be in a hurry to grow too fast. Slow growth is more sustainable and it’s OK if you take 5 years to become an overnight success 🙂 You just need to have the funds and willpower to keep trying. We think of Ethically Creative as a part of our team too – Shona has been an absolutely brilliant sounding board and has elevated our graphic design above and beyond anything we could have created ourselves! …Thanks Phoebe and Aaron! We love to hear these stories and your lessons are SO valuable for everybody to learn from.